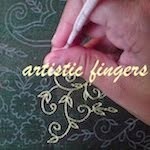 artisticfingers: How to start and end the thread ? 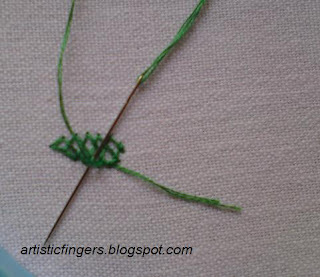 anywhere in the middle and continue to stitch.But if it’s a line stitch then you have to think about the placement. Bring the needle and thread up between ‘a’ and ‘d’ leaving an inch of thread at the back. 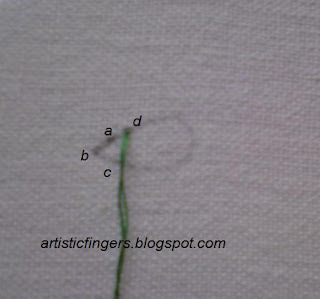 This image shows the back side of the fabric where you can see the thread which was left at the beginning. Work two tiny split stitches between ‘a’ and ‘d’ to anchor the thread ,go back down. 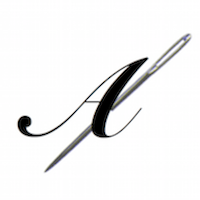 Take the needle back down at ‘a’ and come up at ‘e’. 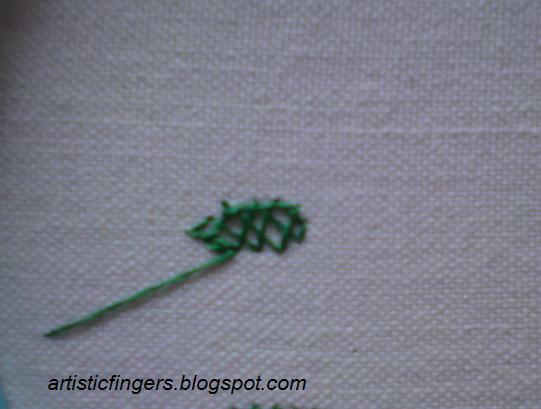 Notice that the anchor stitches are covered by the stitch from ‘d’ to ‘a’. 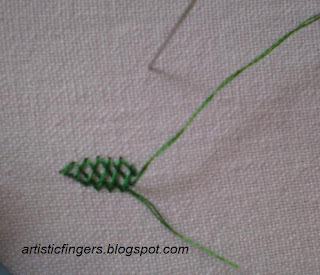 Continue working double back stitch holding the tail thread at the back. The image shows the back side. 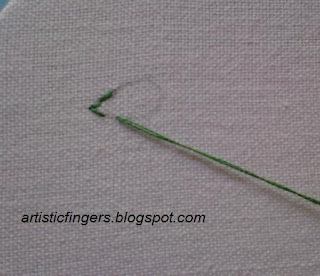 To end the thread, whip it around few stitches to cover approximately an inch and cut the thread. I’ve left a little tail to show y’all the starting and the ending thread. 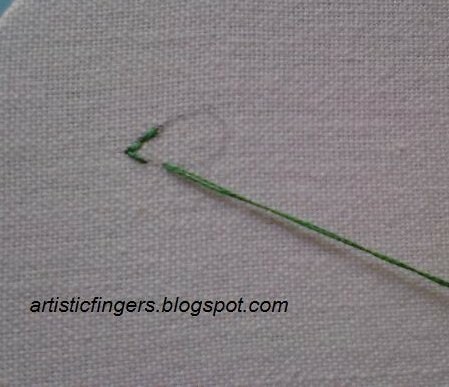 If you are not comfortable working with a tail thread at the back then you can try this method. Make a knot,take the needle down about an inch away from the starting point.Come up between ‘a’ & ‘d’ as shown in method 1,make two tiny split stitches there to anchor the thread & continue stitching. The image above shows the back side of the fabric where I’ve ended the thread just like I showed you in method 1. 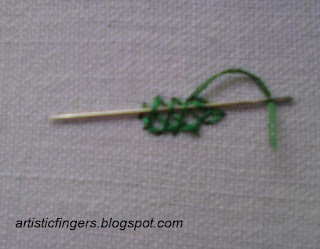 Snip off the knot which we’d put at the beginning. Pass the tail thread through the stitches using a needle.The above image shows the back side of the fabric. 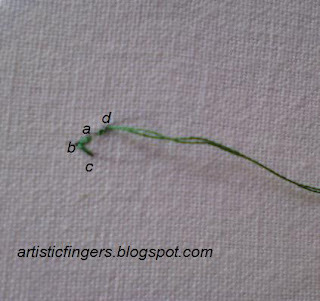 It’s not necessary to follow only these methods to start and end the thread. 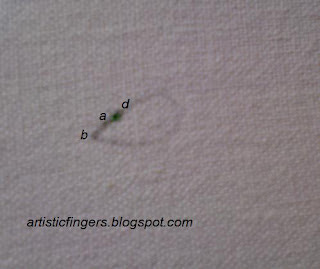 You can follow any method which you are comfortable with. 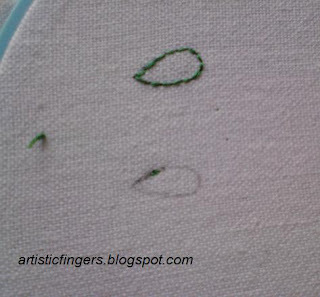 These are the methods that I prefer while doing surface embroidery. 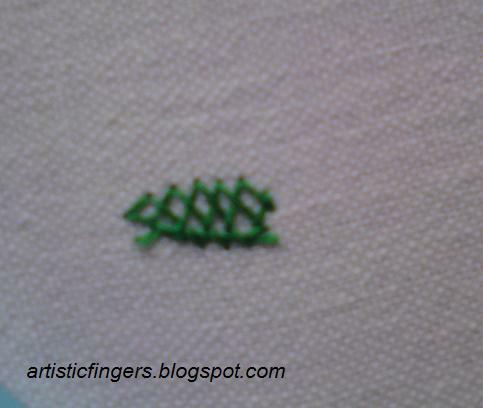 i've started stitching and i love the way the herringbone back creates a shadow on the front. 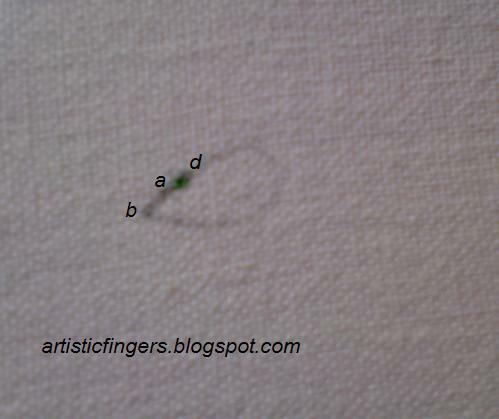 Anita, this was very helpful and clear to me also. Thank you. 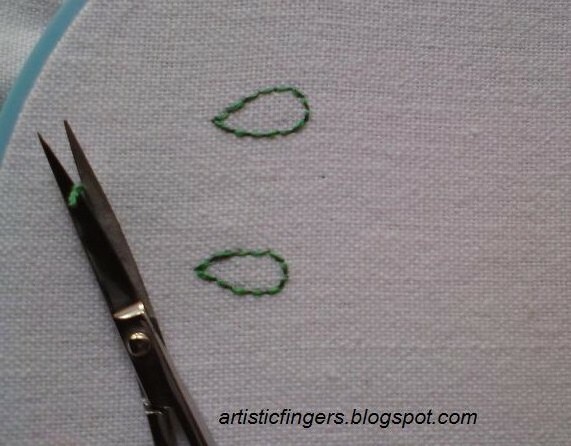 I am hoping though that each tear drop didn't need locked threads to be tied off and clipped? 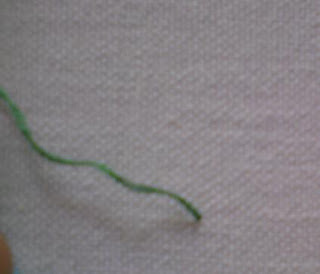 Mine continue from one drop to the next without locking threads in between. I knew you had said not to cut the threads between and just continue but then I got to worrying that I was supposed to be locking the threads and maybe cutting them later :-[ I'm relieved that is not the case since I have put a lot of time in. Thanks for replying! P.S. I wish my stitches looked as wonderful and even as yours! very detailed instructions. Thank You Anita!